Anna Maria Chávez Delivers Keynote at "The Voice for Girls 2012"
In California, The Orange County Register reports that Anna Maria Chávez, chief executive officer of Girl Scouts of the USA, visited the Pacific Club on Friday to speak to business and community leaders about challenges facing today's girls, and what can be done to help them achieve success. 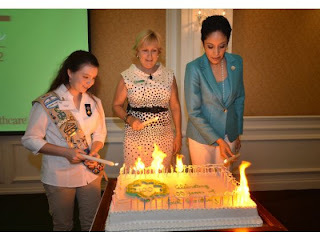 The Voice for Girls 2012 event – which was hosted by the Girl Scouts of Orange County and included breakfast, remarks by female leaders, and a panel discussion – aimed to encourage stakeholders to mentor and positively influence young women, and spread the word about the lack of female leadership in society. "What we want to do is help bring together the community at large in promoting and coaching and mentoring and welcoming girls so that their dreams don't have a dead end," said Nancy Nygren, CEO for Girls Scouts of Orange County. "So it's important to have all of our leaders and our community paying attention." Friday's forum featured keynote remarks by Chávez, who previously served as deputy chief of staff for urban relations and community development for Janet Napolitan. Chávez noted that females are not properly represented in society because they are underrepresented in the work force. "If girls can't put themselves in the shoes of a leader, how do they know what to aspire to?" Chávez said. "They want to see real women in these leadership positions. They want to be mentored by them. So to the amazing women in the room, donate some time. Go talk to them. Go visit them in school, show them what's possible. Because that's what is really holding our girls back at the end of the day. They see it, but they stop dreaming big."